We love fresh picked corn on the cob. I will cook it one of two ways - boil on the stove or grill it. This is my favorite boil method. This makes the best tasting corn. The kernels pop right off the cob into your mouth. Super yummy. 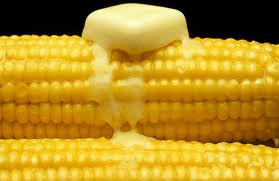 Shuck the ears of corn and remove the silk. Rinse ears with cold water. Place all ears of corn in a large pot. Add water to the pot. Be sure you add enough water to allow the corn to float freely. Add sugar to water. Place pot on stove and bring to boil. Once the water boils, cover the pot and boil for 8 minutes - no longer. Remove pot, drain water and serve the corn with butter and salt.